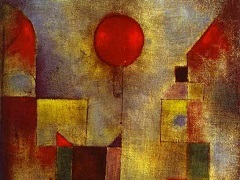 Paul Klee is born on 18 December in Munchenbuchsee, near Bern, Switzerland. His father, Hans Klee (1849-1940), a German, is a music teacher at the Bernisches Staatsseminar in Hofwil, Bern. His mother, Ida Marie, nee Frick (1855-1921), is Swiss, and studied singing at the conservatory in Stuttgart. The Klee family moves to Bern. "As far as my artistic bent goes, there is a legendary great-uncle in my mother's family who is supposed to have been a successful portrait painter in London, but the family soon lost all trace of him. My maternal grandmother drew, painted and embroidered as did every woman of good family in the Biedermeier period: flowers and suchlike pretty things. When I was a very small child, she introduced me to the pleasures of drawing and colouring. My father comes from Thuringia; my mother is half French and half Swiss. Her French descent is a matter not completely clarified; that side of her family may be from southern France." "My first childhood drawings were highly imaginative illustrations. No thought of any model in nature. Flowers, animals, churches, watering cans, horses, wagons, sleds and garden pavilions were recurrent themes. One source of inspiration was sheets of pictures with French verses." Starts primary school in Bern; violin lessons from Karl Jahn. "Jahn had been well taught himself, and followed his model Joachim closely, partly because he was not one of those major talents who learn most from themselves. Nevertheless, his general abilities gave him an excellent basis for personal contacts; this and his outstanding ethical qualities made him an ideal teacher." Starts Secondary School at the Progymnasium Bern. "I attended the first four grades of the local primary school; then my parents sent me to the municipal Progymnasium. I then entered the Literarschule of the Gymnasium. After I passed the cantonal examinations, I graduated in the fall of 1898." "Nature does love me! She consoles me and makes promises to me. On such days I am invulnerable. Outwardly smiling, inwardly laughing more freely, a song in my soul, a twittering whistle on my lips, I cast myself on the bed, and keep watch over my slumbering strength." Starts studying art in October, first at Heinrich Knirr's private art school in Munich. "Backward glance. At first I was a child. Then I wrote nice essays and was also able to reckon (until about my eleventh or twelfth year). Then I developed a passion for girls. Then came the time when I wore my school cap tilted back on my head and only buttoned the lowest button of my coat (fifteen). Then I began to consider myself a landscapist and cursed humanism. I would gladly have left school before the next to last year, but my parents' wishes prevented it. I felt like a martyr. Only what was forbidden pleased me. Drawing and writing. After having barely passed my final examination, I began to paint in Munich." Meets the pianist Lily Stumpf, the daughter of a Munich doctor. Klee's mother, Ida, becomes paralysed and remains so for the rest of her life. "I met the lady who was to become my wife in the autumn of 1899, while I was playing music." Admitted to the Munich Akademie in October, enrols in Franz von Stuck's class. "To be a student of Stuck sounded good. In reality, however, it was not half so splendid. Instead of coming to him with a sound mind I brought a thousand pains and many prejudices. In the realm of colour I found it hard to progress. Since the tone provided by mood predominated strongly in my mastery of form, I sought to find as much profit as possible here at least. And, in this respect, a great deal really was to be gained at Stuck's." Six-month study-tour of Italy with the sculptor Hermann Haller, starting in October (Milan, Genoa, Leghorn, Pisa, Rome, Naples, Florence). Returns to Bern in May 1902: "Ancient Italy remains the chief thing for me even now, the main basis. There is a certain melancholy in the fact that no present lives up to this past. It is probably ironical that ruins should be admired more than what has been well preserved." "Actually, the main thing now is not to paint precociously but to be or, at least, to become an individual. The art of mastering life is the prerequisite for all further forms of expression, whether they are paintings, sculptures, tragedies, or musical compositions. Not only to master life in practice, but to shape it meaningfully within me and to achieve as mature an attitude before it as possible. Obviously this isn't accomplished with a few general precepts but grows like Nature." First etchings; violinist in the Bern municipal orchestra. "June 1903. Toward the end of the month I prepared engravings; first, invented appropriate drawings. Not that I want to become a specialist now. But painting with its failures cries out for the relief of minor successes. Nowadays I am a very tired painter, but my skill as a draughtsman holds up." Journeys to Paris with Hans Bloesch and Louis Moilliet. Visits the Louvre and the Musee du Luxembourg (31 May - 13 June). "Paris gave me impressions that extend well beyond the bounds of visual art, my feelings for humanity suffered an awful depression there; in the particular field of art, however, I raised myself to considerable heights, I have at last attained a free vantage-point over the artistic world throughout the ages. Paris completed what other places began. I even got considerably closer to the Spanish masters Diego Velazquez, Francisco Goya and Zuloaga, particularly the first two." Journeys to Berlin with Hans Bloesch (8-16 April) "Wednesday, 4. 11. To the Centennial Exhibition (National Gallery). Paid particular attention to Feuerbach, Marees, Leibl, Trubner, Menzel, and Liebermann. Empire and Biedermeier did not exactly appeal to me." Marries Lily Stumpf (1876-1946) on 15 September. Lives at Ainmillerstr. 36 in the district of Schwabing, in Munich, from October. "I am legally a spouse, for at the registry office I walked through the door labelled 'Married.' Herr Henzi dispensed noble exhortations to us from behind a large bouquet of flowers, which his words skirted, sometimes to the left, sometimes to the right, and which he addressed sometimes to me, other times to my bride. On the Miinsterplatz the market was open, and the butchers had a laugh as we walked by their stands. Such were their simple souls." First encounter with prints by Daumier and Ensor and works of the French Impressionists. "Above all else there was the magnificent Absinthe Drinker by Manet, which helped me greatly in my efforts with tonality. Then a large array of works which gradually move toward colourism, from Bon Boc to Lady with Parasol. Either the Absinthe Drinker is really the strongest work of the lot, or I am particularly attuned to it at this time. By Claude Monet, there were landscapes of Paris (Boulevard scene!) and surroundings. Gustave Courbet was represented by the great picture The Wrestlers." "...in the summer of 1907 I devoted myself entirely to the appearance of nature and upon these studies built my black-and-white landscapes on glass, 1907/08. No sooner have I mastered that stage than nature again bores me. Perspective makes me yawn. Should I now distort it (I have already tried distortions in a mechanical way)? How shall I most freely cast a bridge between inside and outside?" 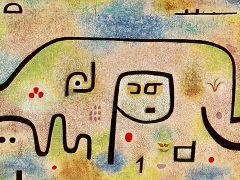 The Klee's son, Felix, is born on 30 November. Visits Van Gogh exhibitions in the Zimmermann and Brakl galleries in Munich. "Van Gogh is congenial to me, 'Vincent' in his letters. Perhaps nature does have something. There is no need, after all, to speak of the smell of earth; it has too peculiar a savour. The words we use to speak about it, I mean, have too peculiar a savour." Conducts correction classes for a few months in the Debschitz art school. "The people there draw industriously, but are also quite mediocre. It's questionable whether I am achieving very much there. But it is not without interest." "With new strength from my naturalistic etudes, I may dare to enter my prime realm of psychic improvisation again. Bound only very indirectly to an impression of nature, I may again dare to give form to what burdens the soul. To note experiences that can turn themselves into linear compositions even in the blackest night. Here a new creative possibility has long since been awaiting me, which only my frustration resulting from isolation interfered with in the past. Working in this way, my real personality will express itself, will be able to emancipate itself into the greatest freedom." Visits the Marees exhibition at the Munich Secession; sees pictures by Paul Cezanne and Henri Matisse. Summer holidays in Bern and Beatenberg (3 June - late October). "Nature can afford to be prodigal in everything, the artist must be frugal down to the smallest detail, Nature is garrulous to the point of confusion, let the artist be truly taciturn. Moreover, in order to be successful, it is necessary never to work toward a conception of the picture completely thought out in advance. Instead, one must give oneself completely to the developing portion of the area to be painted. The total impression is then rooted in the principle of economy: to derive the effect of the whole from a few steps. Will and discipline are everything. Discipline as regards the work as a whole, will as regards its parts. Will and craft are intimately joined here; here, the man who can't do, can't will. The work then accomplishes itself out of these parts thanks to discipline that is directed toward the whole. If my works sometimes produce a primitive impression, this 'primitiveness' is explained by my discipline, which consists in reducing everything to a few steps. It is no more than economy; that is, the ultimate professional awareness. Which is to say, the opposite of real primitiveness. I also saw eight pictures by Cezanne at the Sucession. In my eyes he is the teacher par excellence, much more of a teacher than Van Gogh." Exhibition of fifty-six works at the Kunstmuseum in Bern, the Kunsthaus in Zurich and a gallery in Winterthur, Switzerland. "March. And now an altogether revolutionary discovery: to adapt oneself to the contents of the paintbox is more important than nature and its study. I must some day be able to improvise freely on the chromatic keyboard of the rows of watercolour cups." Produces illustrations for Voltaire's Candide. Visits Louis Moilliet on Lake Thun and meets August Macke. Meets Wassily Kandinsky and the Blue Rider artists in Munich. Contributes to the magazine Die Alpen, edited by Bloesch. "Kandinsky wants to organize a new society of artists. Personal acquaintance has given me a somewhat deeper confidence in him. He is somebody and has an exceptionally fine, clear mind." "Nature is imbued with a rhythm that in its multiplicity cannot be constrained. Art should imitate it in this, in order to purify itself to the same height of sublimity, to raise itself to visions of multiple harmony, a harmony of colours separating and coming together again in the same action. This synchronic action is the actual and only subject (sujet) of painting." Takes part in the 'Erster Deutscher Herbstsalon' (First German Autumn Salon) in Berlin. "Tie small-scale contrasts together compositionally, but also large-scale contrasts; for instance: confront chaos with order, so that both groups, which are separately coherent, become related when they are placed next to or above each other; they enter into the relation of contrast, whereby the characters of both sides are mutually heightened. Whether I can already accomplish such things is questionable on the positive side - and more than questionable, unfortunately, on the negative side. But the inner urge is there. The technique will develop in time." In April, journeys to the south of France and Tunisia with Louis Moilliet and August Macke (Tunis, Hammamet, Kairouan; return via Palermo, Naples, Rome). Founder-member of the 'Neue Munchner Sezession.' "Wednesday, 4. 8. Tunis. My head is full of the impressions of last night's walk. Art-Nature-Self. Went to work at once and painted in watercolor in the Arab quarter. Began the synthesis of urban architecture and pictorial architecture. Not yet pure, but quite attractive, somewhat too much of the mood, the enthusiasm of travelling in it - the Self, in a word. Things will no doubt get more objective later, once the intoxication has worn off a bit." "The evening is indescribable. And on top of everything else a full moon came up. Louis urged me to paint it. I said: it will be an exercise at best: Naturally I am not up to this kind of nature. Still, I know a bit more than I did before. I know the disparity between my inadequate resources and nature. This is an internal affair to keep me busy for the next few years." "I try to paint. The reeds and bushes provide a beautiful rhythm of patches." "At two o'clock, Kairouan. Small French suburb with two hotels. Our thirst for tea is abundantly slaked, so that the discovery of this marvelous Kairouan may be carried through properly. At first, an overwhelming tumult, culminating that night with the Manage arabe. No single thing, but the total effect. And what a totality it was! The essence of A Thousand and One Nights, with a ninety-nine percent reality content. What an aroma, how penetrating, how intoxicating, and at the same time clarifying. Nourishment, the most real and substantial nourishment and delicious drink. Food and intoxication. Scented wood is burning. Home?" "I now abandon work. It penetrates so deeply and so gently into me, I feel it and it gives me confidence in myself without effort. Colour possesses me. I don't have to pursue it. It will possess me always, I know it. That is the meaning of this happy hour: Colour and I are one. I am a painter." 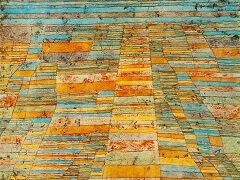 Rainer Maria Rilke visits Klee in the summer; journeys to Switzerland; Klee produces some sculptures. "One deserts the realm of the here and now to transfer one's activity into a realm of the yonder where total affirmation is possible. The cool Romanticism of this style without pathos is unheard of. The more horrible this world (as today, for instance), the more abstract our art, whereas a happy world brings forth an art of the here and now." "I have long had this war inside me. This is why, interiorly, it means nothing to me. And to work my way out of my ruins, I had to fly. And I flew. I remain in this ruined world only in memory, as one occasionally does in retrospect. Thus, I am 'abstract with memories.'" Franz Marc is killed at Verdun on 4 March. Klee enters military service on 11 March. Military training in Landshut and Munich and later at the airforce base in Schleissheim, near Munich, in the summer. Escorts military transport convoys. "When I tell what kind of person Franz Marc is, I must at once confess that I shall also be telling what kind of person I am, for much that I participated in belonged also to him. He is more human, he loves more warmly, is more demonstrative. He responds to animals as if they were human. He raises them to his level. He does not begin by dissolving himself, becoming merely a part in the whole, so as to place himself on the same level with plants and stones and animals... I place myself at a remote starting point of creation, whence I state 'a priori' formulas for men, beasts, plants, stones and the elements, and for the whirling forces..."
Accompanied a military convoy to Nordholz near Cuxhaven. Returned via Berlin. Visited Herwarth Walden and Bernhard Koehler. Transferred to the flying-school at Gersthofen near Augsburg. Exhibition at Der Sturm gallery, a financial success. "We investigate the formal for the sake of expression and of the insights into our soul which are thereby provided. Philosophy, so they say, has a taste for art; at the beginning I was amazed at how much they saw. For I had only been thinking about form, the rest of it had followed by itself. An awakened awareness of 'the rest of it' has helped me greatly since then and provided me with greater variablility in creation. I was even able to become an illustrator of ideas again, now that I had fought my way through formal problems. And now I no longer saw any abstract art. Only abstraction from the transitory remained. The world was my subject, even though it was not the visible world." On leave from military service, Klee returns to his family in Munich in December, after the end of the war. Discharged in February 1919. "Yesterday afternoon I took a nice walk. The scene was drenched in a sulphur yellow, only the water was a turquoise blue-blue to deepest ultramarine. The sap colours the meadows in yellow, carmine, and violet. I walked about in the river bed, and since I was wearing boots, I was able to wade through the water in many places. I found the most beautiful polished stones. I took along a few washed-out tiles. It is just a short step from this to plastic form." "I remember as if it had happened only a short time ago the December of 1918 when my father returned home in a field-grey uniform at Christmas time to our small, modest, dark apartment in Schwabing. Christmas is a matter of great importance to a child. My mother shut herself up mysteriously in the music room where she made a suspicious rustling over the Christmas packages, and my father was happy to be released from all other duties and to be able to celebrate his thirty-ninth birthday and Christmas peacefully with his family." Studio in Munich in the Late Baroque Suresnes Palais in Werneckstrasse; member of the arts committee of the Raterepublik (Bavarian Soviet Republic); travels to Switzerland in June after the collapse of the Republic; in June and July Baumeister and Schlemmer unsuccessfully attempt to secure a post for Klee in Stuttgart. Contract with the Hans Goltz gallery in Munich in October. "Hans Goltz, the courageous art dealer who had earlier displayed abstract art to the astounded citizens of Munich in his rooms on Briennerstrasse, twice signed a three-year contract with my father. As I have said, our own apartment lacked suitable working space and my father began looking around for a studio. He found one in the charming little Rococo palace of Suresnes on Werneckstrasse in the old quarter of Schwabing. Here he rented a splendid room with a view of the ancient park full of grottoes and winding paths, and of the adjacent English Garden." Is appointed to the Bauhaus in Weimar by Walter Gropius on 29 October. Theoretical essay published in Edschmid's anthology Creative Credo. "An apple tree in blossom, its roots, the rising sap, the trunk, a cross section with annual rings, the blossom, its structure, its sexual functions, the fruit, the core and seeds. An interplay of States of growth." "Arrived safely, met by Itten and Muche. Discussed things with Gropius. Looked round the Bauhaus this morning, then signed the contract with Gropius at lunchtime. This is not final until it has been ratified by the government. This afternoon I am going to the housing office (formality). Cordially and see you on Sunday! Regards to Felix etc. Yours, Paul." "Since we did not find a place to live in Weimar, my father temporarily divided his time between Munich and Weimar, spending two weeks in one place and two weeks in the other. A year later, in October, 1921, we moved out of the metropolis of Munich to the highly individual small town so rich in tradition in the heart of Thuringia. We found a spacious four-room apartment above Goethe Park, in the house belonging to Count Keyserling. Each day we walked through the park to the Bauhaus. My father went up to his studio on the third floor and I to the cabinetworkers' shops in the rear building, where I worked. At every season of the year Klee made the walk fascinating with his observations. In winter we watched the small coots on the frozen Ilm; like unskillful ice skaters, they frequently tumbled over; in summer the innumerable songbirds, the woodpeckers, the ringdoves; and in the spring my father would tell me the names of all the flowers we saw." Starts teaching at the Bauhaus on 1 January. Spends the summer in Possenhofen on Lake Starnberg. Moves to Weimar in September. Begins writing up his Bauhaus lectures in the winter semester 1921/22 ('Beitrage zur bildnerischen Formlehre'). "In the first place, what do we mean by movement in the work? As a rule our works don't move. After all, we are not a robot factory. No, in themselves our works, or most of them, stay quietly in place, and yet they are all movement. Movement is inherent in all becoming, and before the work is, it must become, just as the world became before it was, after the words; "In the beginning God created the world," and must go on becoming before it is (will be) in the future... Seen cosmically, movement is fundamental and as an unending power needs no impulse. The stillness of objects in the earthly sphere is the material inhibition of movement. It is fallacious to assume that the earth's attraction is the norm. The history of the work, which is chiefly genesis, may be briefly characterized as a secret spark from somewhere, which kindles the spirit of man with its glow and moves his hand; the spark moves through his hand, and the movement is translated into matter." Summer in Possenhofen. Kandinsky is appointed to the Bauhaus. "The summers of the years 1920 to 1922 were a delight to all of us, for we spent them in Possenhofen on Starnberg Lake. My father particularly enjoyed being able to swim to his heart's delight after painting, to go for walks, and above all to fish. The first year-1920-we stayed in the house called 'Greeting to God' owned by a Frau von Eckardt, and took our meals in the neighbouring tavern, 'The Shower.' For the next two years -1921 and 1922 - we had five rooms at the home of a fisherman named Gebhardt, near the steamer landing stage. My father painted out in the open air on the huge balcony, using a bench as an easel." The essay 'Wege des Naturstudiums' is published in a Bauhaus anthology. Spends the winter on the island of Baltrum. "For the artist, dialogue with nature remains a conditio sine qua non. The artist is a man, himself nature and a part of nature in natural space." First exhibition of Klee's work held in America at the Societe Anonyme in New York in January/February, organized by Katherine Dreier. Lecture 'On Modern Art' given at the Art Association in Jena. Foundation of the 'Blaue Vier' (Blue Four) group by Emmy Galka Scheyer (Klee, Kandinsky, Feininger, Jawlensky). Travels to Sicily (Taormina, Mazzaro, Syracuse, Gela). The Bauhaus closes down in Weimar on 26 December, and reopens in Dessau. "From type to prototype. Presumptuous is the artist who does not follow his road through to the end. But chosen are those artists who penetrate to the region of that secret place where primeval power nurtures all evolution. There, where the power-house of all time and space - call it brain or heart of creation - activates every function; who is the artist who would not dwell there? In the womb of nature, at the source of creation, where the secret key to all lies guarded. But not all can enter. Each should follow where the pulse of his own heart leads. So, in their time, the Impressionists - our opposites of yesterday - had every right to dwell within the matted undergrowth of everyday vision. But our pounding heart drives us down, deep down to the source of all. What springs from this source, whatever it may be called, dream, idea or phantasy-must be taken seriously only if it unites with the proper creative means to form a work of art. Then those curiosities become realities - realities of art which help to lift life out of its mediocrity. For not only do they, to some extent, add more spirit to the seen, but they also make secret visions visible." Klee's Padagogisches Skizzenbuch is published. First exhibition in Paris. "Since the 'master's' house which was being built specially for Klee was not ready before the summer of 1926, we remained in our Weimar home for the time being. Once again Klee spent a year travelling at two-week intervals back and forth between the two cities. 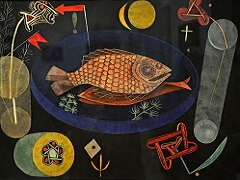 He had a furnished room with the Kandinsky's and taught in the provisional quarters of the new Bauhaus." Moves to Dessau in July. Travels to Italy in October/November (Elba, Milan, Genoa, Pisa, Florence, Ravenna). Opening of the Bauhaus building designed by Gropius (December). "In July, 1926, we moved into one of the master's houses in Dessau. Burgkuhnauerallee 7, a street that was later renamed Stresemannallee. The colony consisted of five houses: a single house for the director and four double houses for the masters. In these houses lived Gropius, Moholy-Nagy, Feininger, Muche, Schlemmer, Kandinsky and Klee. Hence we were separated from the Kandinskys only by a wall; we saw and greeted one another daily without in the least interfering with one another. Our little settlement was situated in one of those pine groves characteristic of central Germany, and had no fences to the rear." "But my favourite outing was a trip to Oranienbaum and Worlitz. The latter place was surrounded by an enchanting park full of lakes and watercourses that made the visitor forget the monotony of the surrounding Elbe flatlands. We strolled past Aeolian harps and exotic giant trees, across rickety footbridges, and took the ferries to the islands. Here Paul Klee was thoroughly in his element, and many of his pictures with plant or water subjects were the outcome of visits to this wonderful park." Summer visits to the island of Porquerolles, near Toulon, and Corsica. "Sometimes when we young people went swimming, my father retreated to the cliffs, spread out a handkerchief and did drawings from nature to his heart's desire. Later, he travelled on alone to Corsica, which he told about with immense enthusiasm. He had an everlasting longing for the south, for the Mediterranean, and his contacts with these lands visibly transformed him; in spite of the intense heat he always came from such trips with his vitality and creativity greatly strengthened." Spends the summer in Brittany. Essay 'Exact Experiments in the Realm of Art' published in the magazine Bauhaus. From 17 December 1928 - 17 January 1929, travels to Egypt (Alexandria, Cairo, Gizeh, Luxor, Karnak, Valley of the Kings, Thebes, Aswan, Elephant Island). Hannes Meyer succeeds Gropius at the Bauhaus. "...intuition is still not wholly dispensable. we produce evidence, reasons, support; we design models, we organize: all well and good. but we do not achieve totalization, we work hard; but genius is not hard work as the saying misleadingly suggests, hard work is not even a part of genius although men of genius are hard-working as well. Genius is Genius, is blessing, is without beginning and without end, is begetting." 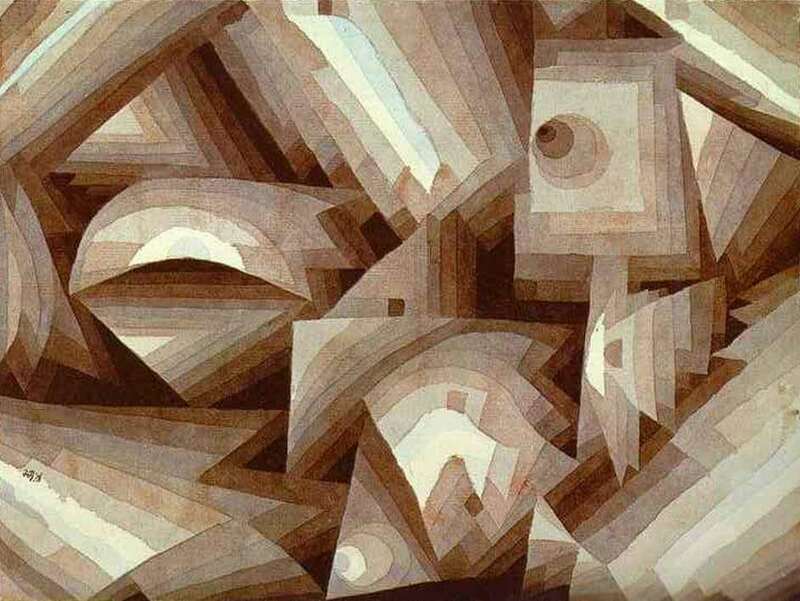 "During this Egyptian trip, Klee worked very little, perhaps not at all. He merely stored up impressions. Later on, we constantly recognized themes in his work that dealt directly or indirectly with the landscape and the population of Egypt." Spends the summer in the Villa Louisiana, near Biarritz, in the south of France. Celebrates his fiftieth birthday in the Bauhaus. Exhibition at the Galerie Flechtheim in Berlin. "You have probably heard about all that was going on last week, and I'm sure I don't need to spell out for you what it was like on my fiftieth and the few days afterwards. It would be difficult to bring order to the picture of very conflicting sentiments. Exhibition in New York, Saarbrilcken, Dusseldorf and Dresden. 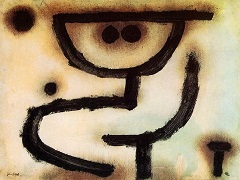 Klee is offered a post at the Kunstakademie (Art Academy) in Dusseldorf by Dr. Kaesbach. Spends the summer in the Engadin and Viareggio. Mies van der Rohe becomes Director of the Bauhaus. "Because of the promptness of the press I had two busy days, I quickly had to inform Kandinsky and Hannes Meyer that the Dusseldorf appointment is now settled in principle. It was predictable that this would be followed by an official visit from the Lord Mayor and Dr. Grote, and also that there would be no lack of promises from that side. Of course I stood firm, as I am not a reed and in the expectation that everything will be done in Dusseldorf to make the move easier." Resignes from the Bauhaus; becomes Professor at the Academy in Dusseldorf. Second journey to Sicily (Syracuse, Ragusa, Agrigento, Palermo, Monreale). "Once I worked at home all the time for weeks, and then I suddenly discovered on a walk near Bern that actually nature is incredibly beautiful. I then tried to capture this. Now, to, I always make studies out of doors, without directly drawing, but the eye does draw, and there are places that have an enormous influence. There is no area in which we can manage without nature-studies." Sees the Picasso exhibition in Zurich in October. Travels to Venice and Padua. Bauhaus closes in Dessau and moves to Berlin. "Art relates to creation like a simile. The bond with optical reality is very elastic. The world of form is sovereign for itself, but in fact not yet art in the highest circle. In the highest circle a mystery reigns over ambiguity - and the light of the intellect goes Out pitifully." Klee's house in Dessau is searched. Abusive criticism in Nazi press. Dismissed from the Dusseldorf Akademie on 1 May. Moves from Dessau to Dusseldorf (Heinrichstrasse 36) in early May. On the Cote d'Azur in October (Nice, Saint-Raphael, Hyeres, Port-Cros, Toulon). Kahnweiler concludes an exclusive contract with Klee. Returns to Bern in December. "Not since my return from Venice have I worked as in the last two weeks. The quantity is not the point, but the wholeness and the joy that thereby sets in every day for a few hours. Once again I managed to banish all scepticism from this process. And much is released that was threatening to become ballast. Everthing cast off. There are a few drawings that expressly deal with casting off ballast, fairly reactive things, far from the earlier drastic-reactive kind, but also sublimated or refined as such in character." "Now everything has been cleared out. I shall most probably leave this place tomorrow evening. Then come the wonderful days of Christmas, when bells ring in every child's head. I have grown a little older in the last few weeks. But I don't want to let any bitterness creep in, or only bitterness tempered with humour. It's easy enough for men. Women tend to resort in Such cases to tears..."
In Bern he lives first in Obstberg, then in Kollerweg, finally at Kistlerweg 6. Will Grohmann publishes his book on the drawings produced from 1921 to 1930, which is later seized by the Nazis. Onset of illness (scleroderma). Retrospective in the Kunsthalle, Bern. Treatment in Tarasp and Montana. Only twenty-five works are produced this year. 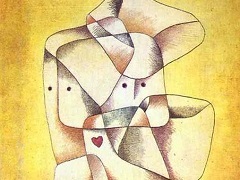 Seventeen works by Klee are shown in the 'Degenerate Art' exhibition. Stays in Ascona in September. Picasso visites Bern in November. "This new creative upsurge began in 1937, and was truly a surprise to all of us, Grohmann divides this last creative period into the following categories: humor of the late years, late pastels, symbol pictures with thin, heavy and outlined bars, large panels, conceptual pictures, tragicdemonic and intimations of death, the series of angels, and requiem. Spends the summer in Beatenberg. Exhibitions in New York and Paris. Braque visits Klee in April. 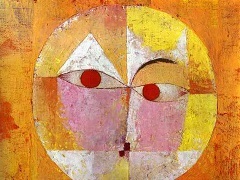 Klee sees the Prado exhibition in Geneva in summer. Stays on Lake Murten in the autumn. 1253 works are produced during the year. Applies for Swiss citizenship, which is not granted during his lifetime. "Production is increasing at a greater tempo, and I can't quite keep up with these children. They dart off. A degree of adjustment takes place in that drawings predominate. Twelve hundred numbers in 1939 is definitely a record, though."